Sung-Hee Choi (front, second from right), outside the prison. Photo by Youngsil Kang. Korean peace activist Sung-Hee Choi was released from Jeju Island prison today, August 17, where she’d been held since May 19 on multiple charges of obstructing the business of naval base construction contractors. After a series of court hearings through the summer, Choi was convicted and sentenced to eight months in jail. A two-year stay on execution of the sentence was granted, effectively placing Choi on probation for that period. 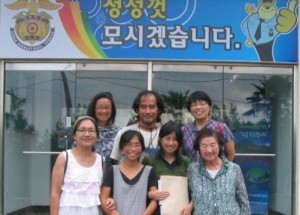 Although not a native of Jeju island, Choi was inspired by the residents of most affected Gangjeong village to join their four-year-old nonviolent resistance campaign. They have slowed construction of a major navy base, and in recent months provoked a new level of state backlash and repression. Also on July 12, the Korean Navy and Minister of Justice filed suit against 77 named individuals and five community organizations, ordering that they stay away from the coastal construction zone, and to remove within one week the tents that have served as a base camp for blockades, lockdowns, banner hanging and other protest activity for years. Fines equivalent to $5,000 per day for any violation would be charged to village mayor Kang Dong-Kyun. Three days later, four van loads of police entered the village to arrest Kang and resistance leaders Brother Song Kang-Ho, and Go Kwon-Il. The mayor was released that night, and Song applied for bail and was released July 29. Go began fasting when the men were arrested, and ended his fast August 8 when he was released. Brother Song’s religious peace community, The Frontiers, are hosting mainland Korean and international supporters at an encampment on the threatened coast from August 15-21, and anticipating a raid any day now from more than 500 police recently brought in from the mainland, along with water cannons and crowd suppression vehicles. A court decision on the issue of the July 12 government order is also imminent.